The oft-delayed What Else Records release from The Causey Way still seems to be a go, according to a label representative. Six new tracks are on track for later this Summer, so cross your fingers, Category C members! The out of print b-sides comp What Remains Inside A Black Hole will be remixed and reissued on Estrus Records later this year. So for those of you hoping for a new album... well... this is technically new. With all new packaging and a new title, "Bayond the Black Hole", one would hope we'd be thrown a bone with new bonus tracks. The last USA shows with Blazar the Probe Handler were also recorded recently for a future live album release. Stay tuned to your local news sites for the latest on that. The marvelous Japanese TransFormers PVCs are still on track, and a variety of news and rumors-- much of which is still questionable-- is circulating. Despite news in a recent issue of ToyFare, it seems that news sources are still debating if clear figures will be included in Act 3. (For more on these toys, click here. In other non-real-toy news, Flagstaff, Arizona-based Big Bad Toy Store is beginning to offer large busts of old TransFormers characters. Worth a look for the TransFan in you. Game Cube: Nintendo's latest monster is due out this November at pennies under $200. Games include Luigi's Mansion, where the famous sibling will search for ghosts using a flashlight and a vacuum cleaner; Rogue Leader, a powerhouse of a sequel to Star Wars: Rogue Squadron; and Metroid Prime. Rumor has it another Mario title may be ready at launch. Jet Grind Radio Sequel: Jet Set Radio Future is slated as an exclusive title for the upcoming Microsoft X-Box. Metroid Continues: Even though reports said Super Metroid would be the last Metroid game (or the last one with the name), two new titles were announced. Metroid IV will be a 2D title for GameBoy Advance, and Metroid Prime will be for Gamecube. PlayStation 2 Still Dull...: With killer apps like Final Fantasy X and Metal Gear Solid 2 on the horizon, it looks like hard-to-please PS2 owners will have something to boast about real soon. ...but Xbox Far Worse: With very few titles looking to be must-buys, a $299 MSRP, and DVD movie playback requiring additional purchases, the overall reporting and buzz seems to be that while it's plenty powerful, it could be a while before there's much to get excited about beyond another Oddworld title and a few Sega titles. All these stories and more are covered by people with press credentials at sites like Videogames.com, The Gaming Intelligence Agency, and other fine outlets. 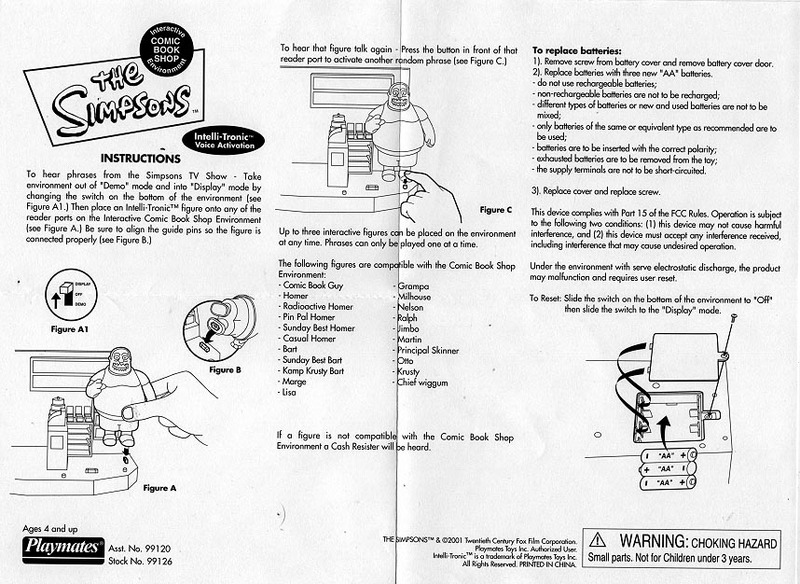 Toy Archive: The Simpsons Archive has been updated with Ned Flanders and revised checklists. Music: Still not done. But if you wanna help, and you have a band (or a record label), send us your stuff and we'll review it. Word on the wire is that manufacturer Vital Toys is doing away with the five-piece box set in favor of a figure two-pack. Needless to say, we aren't especially happy, nor are we 100% positive this is what's happening just yet. With fans still reeling over the ridiculous sellout of the Toy Fare Exclusive Pin Pal Burns figure (and its equally ridiculous going rate for a pre-sell on eBay), the next exclusive has been announced: Boxing Homer. The figure looks great, and is available for a particularly high rate in conjunction with subscriptions being sold from the magazine's website. The rate? $44 for a one-year subscription and the figure. Ouch. The rumor mill for the rest of the year sounds pretty nifty. Rumor has it, from a few tipsters here and there, that a Simpsons Family assortment of at least four figures will be offered in Christmas-themed outfits later this year, including a Marge/Maggie two-pack and Santa Homer. Also, another Treehouse of Horror set with Kang, Kodos, Bart's evil twin (the one that eats fish heads) and a fourth figure is rumored as well. Rounding out the exclusive juggernaut is a Diamond Comics/PREVIEWS exclusive set with Ramier Wolfcastle/McBain as Radioactive Man and Milhouse as Fallout Boy. Wave 4 continues to roll out, evidenced by the lone Patty or Casual Homers found on pegs at Target or Wal-Mart. (Or Suncoast for three bucks more.) The playsets have also hit, with the Comic Shop scoring a huge hit with fans and the Bowling Alley not so much. In a related story, anyone who ordered an extra Pin Pal Burns to trade, let us know-- we got our request denied. Send in a trade list or something. If you're gonzo over the new Spider-Man Classics figures and still haven't found them, worry not-- you might be in luck. Bins upon bins of all four of the first series are showing up at Arizona Toys "R" Us stores for $6.99 per. Toy Archive: The Simpsons Archive has been updated with Chief Wiggum. We plan on adding more figures to the archive for Monday, so be sure to come back to see those... unless you already have them, in which case you just won't care. For anyone who found this site NOT through my Star Wars addiction, check out Yakface.com's delightful Q&A section which I write, elegantly entitled With Every Question For Justice. "Oh, I've wasted my life"
Click Here For News From April!